Your High 3 Salary is an important part of your pension calculation for federal retirement. Your High 3 Salary is the highest average basic pay you earned during any 3 consecutive years of Federal service. You should also know that your High 3 Salary is calculated based on three *consecutive* years, NOT calendar years. So your High-3 years might be April 2015 – April 2018. Most people earn their highest pay during their last three years of service. But not always. Your High 3 years could be from an earlier time in your career. Make sure to review your entire earnings history. Where can you find info on your basic pay? Look on your Standard Form 50’s (SF50). Sometimes you can also find it on your Leave and Earning Statements (LES). Why Do I Need to Know My High 3 Salary? The first reason is pretty straight-forward. You need to know your High 3 Salary to estimate your federal pension. And you need to know what your federal pension will be so you can plan your retirement and make sure that you have enough money before retiring. The second reason you need to know your High 3 Salary for federal retirement is because about 10-15% of federal retirement applications have an error in processing. And depending on which agency submits the application to OPM, the error rates can be much higher. You need to have your ducks in a row and know your numbers so that when your retirement is processed, you’ll know whether or not you are receiving the correct amount. Federal Employees in Non-Foreign Areas like Alaska, Hawaii and Puerto Rico, have been transitioned from receiving primarily COLA to primarily Locality Pay. Locality Pay *is* considered when calculating your High 3 Salary, but COLA is not. If you had time in an area with high Locality Pay, be especially sure to review your entire career before automatically assuming your High-3 are your last three years of service. Click here to learn more about the change from COLA to Locality Pay. If you are 5+ years from retirement – you might not want to spend tons of time calculating your High 3 Salary. If you’re just looking for a ballpark estimate, this is the fastest way to get a rough idea of your High 3. Just take the three consecutive years where you received the highest pay (usually your last 3 years) and take your basic pay from the year in the middle. Simple – sure, but it’s often pretty close to your actual High 3 Salary. And if you’re 5+ years from retirement, your High 3 will probably change by the time you’re ready to retire anyway. If you are close to retirement, you’ll want a more specific calculation of your High 3. Gather your SF50’s and get ready for some number crunching. Since your pay probably increased at odd times during the year – you’ll need to account for those times when calculating your High 3 Salary. In this example, this person’s High-3 time was from 9/1/2015 to 8/31/2018. Their basic pay increased several times during this period. Looking at the first row, we see that from 9/1/2015 to 1/4/2016, this person had a basic pay of $48,657. Four months and three days represents the time between 9/1/2015 and 1/4/2016. Using the Time Factor Table, we find that 4 months and 3 days = 0.342 of a year. Then we multiply their basic pay of $48,657 x 0.342 to get $16,641. This is the actual basic pay that was earned during this time period. We complete a row every time they received an increase in basic pay. Then we add the last column up to get the total amount of basic pay they received during their High 3. In this example, the number is $165,159. Then we take that number and divide by 3 to get their High 3 Salary of $55,053. It can be a bit tedious. But, if you had several changes in your basic pay during your High 3 years, this method will help you calculate your High 3 pay to use in your Federal pension calculation. Here is a blank table that you can print out and use to calculate your High Three Salary. If your High-3 will be based on the last three years of service, start by subtracting 3 years from your planned retirement date. If there was another time in your career that had higher pay, use those 3 years instead. 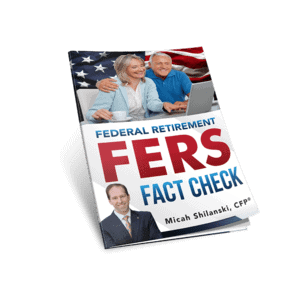 Do You Understand Your Federal Retirement Benefits? Federal retirement benefits are complex. While your HR can be a helpful resource – *you* are responsible for your retirement. And you need to make sure you understand your benefits *before* you retire.